A crown jewel of the NYC skyline, the Chrysler Building certainly lights up our life. Author David Stravitz stumbled onto a collection of negatives from a commercial photographer who chronicled the construction of the Chrysler Building (1930). The journey begins at the vacant lot and takes you all the way through to the opening day portrait, with aerial views, and the streetscape of the completed building. We were fascinated by the many “detail” photos, including the Cloud Club, the clocks, elevator doors, window frames, the car showroom, etc. This amazing collection of never-before-seen pictures (along with the informative text) is sure to entertain you as much as it did us. 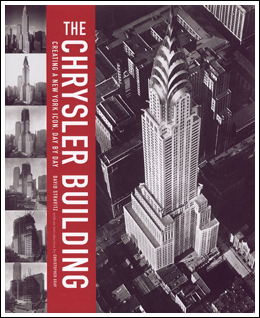 A must for architects and skyscrapers fans. 192 pages, over 150 duotone photos, 10” X 12”, HC. Creating a New York Icon.